Our flower guide is an all-time favorite. Discover flower garden ideas that will reflect your own style, yet are easily done. Not sure what flowers to plant? Our guide of popular annuals and perennials will give a jump start your garden plans. If you're just beginning a garden, choosing your flowers can be tricky. The endless flower varieties have individual needs. Should you plant annuals, perennials, or bulbs? Follow our flower guide, and make it easy and fun. Be sure to check your planting zones as you make your garden plans. Annuals are flowers you plant each year. 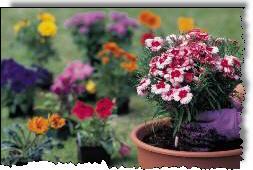 The good news about annuals is they are inexpensive... real easy on the pocketbook! Many annual flowers bloom all summer, but some bloom for a month or two at a certain time. The secret is to plant the varied blooms in clusters so that as one is losing color, nearby flowers are just coming into full color. Annuals grow wonderfully in container gardens as well. Mass Plantings - When you plant dozens of one type of annual, the effect is stunning. Use a full range of colors or a single color... that depends on your taste! Mass planting is great for filling large areas, or filling in spots such as along side your front steps or sidewalk. Make a Mixed Garden - Whichever annual flowers you choose to plant, try bringing together four or five types to make a mixed garden. You can also plant annuals among perennial spring flowers to create a beautifully diverse garden. Try mingling annuals with flower bulbs, like Easter flowers and lilies for beautiful mixed flower garden ideas. Make it easy... check out our flower guide of popular annual flowers! Begonia - Height: 6 to 12 inches tall. These flowers are very reliable, producing white, pink, red, rose and scarlet flowers. Easy care in bright or shady locations. Use in edgings, mass plantings, containers, even indoors. Partial shade is best, and if your temperature stays below 90 degrees, full sun is OK. Impatiens - Height: 1½ feet. Impatiens are easy to grow, and bloom from early summer until fall. They tolerate shade well, and colors are white, pink, rose, scarlet, violet, salmon, and orange. If your summers are hot, plant impatiens in partial shade, and water them well if exposed to sun. Marigold - Height: 6 inches to 4 feet. Popular for their warm colors and easy care, marigold grow fast! There are several types which grow to different heights. Great for planting in gardens or containers, you'll get a spectrum of colors - yellow, gold, orange white, near red, and mahogany. Plant them in full sun and well drained, moist soil. Petunia - Height: 10 to 18 inches. For excellent color and easy growth, petunias are hard to beat. Their colors are everything but orange and green. Plant them in full sun or light shade. You can use them in mixed beds, mass plantings, edgings, containers... almost anywhere you like! Sweet Alyssum - Height: 3 to 6 inches. No flower guide is complete with sweet alyssum flowers. Easy to grow and low care, sweet alyssum blooms are white, rose, purple or lavender. Plant in full sun or partial shade, in almost any soil. Zinnia - Height: 6 to 36 inches. These flowers are quite durable, grow fast, and bloom in all colors except blue. You can buy dwarfs (6 - 12 inches tall), intermediates (these grow about knee-high) and tall types (3 feet, even a bit taller). Zinnias love heat and full sun, and tolerate most any well-drained soil. Gardeners! Sign up now to receive our FREE practical guide to dealing with pests, diseases and disorders that commonly affect lawns, vegetables, trees and garden flowers. Get 101 Gardening Tips: A - Z of Pests, Diseases and Disorders. Completely FREE! And there's more. Discover climbing annual flowers that would love to grow on you garden trellis! Ready for more great flower garden ideas? Read on to our quick flower guide about perennial spring flowers. Learn how to revitalize your backyard with the magic of tropical flowers. And... if you need a flower guide to help you learn rose gardening, you are in for a real treat!